Home » Health & Wellness » Healthy Lifestyle » Vaping and E-Cigarettes: Is Smoking Still Bad for You? While cigarette smoking is in decline, the use of e-cigarettes has rapidly expanded in recent years, especially among young adults and teens. The popularity of “vaping” has grown faster than the scientific knowledge about it, leaving questions about vaping’s health effects. E-cigarettes were introduced in the U.S. in 2007 as an alternative to tobacco cigarettes. Since they don’t burn tobacco, vapers could “light up” indoors, where cigarette smoking was banned. E-cigarette makers also promote them as a tool to quit smoking. E-cigarettes are battery-operated devices that can look like a real cigarette or pen. They have containers filled with liquid that’s usually made of nicotine, flavorings, and other chemicals. A heating device turns the liquid into vapor that you inhale when you take a puff. E-cigarette liquids come in dozens of flavors, including mint, spices and fruits. Vaping has increased in popularity. There are hundreds of types of e-cigarettes on the market, but one brand, JUUL, has become the choice of many young adults and teens. About three million high school students reported vaping in 2018. E-cigarette makers claim that vaping is safer than smoking and can help smokers quit. The CDC and other health organizations generally agree that vaping is safer since vapor doesn’t contain the many toxic chemicals found in tobacco smoke. However, the FDA does not regulate e-cigarettes – their contents are not controlled – and it has not approved them as a quit-smoking aid. Also, most e-cigarette liquids contain nicotine, the highly addictive drug found in tobacco, so vapers can get hooked on nicotine just like smokers. And smokers who use vaping to quit cigarettes may just be trading one addiction for another. Nicotine has been shown to harm the developing brains of kids and may damage the heart and arteries. Some other chemicals in vapor have been linked to cancer, as well as heart and respiratory disease. Vaping is a gateway to smoking. Teens who vape are 30% more likely to start using cigarettes than those who don’t vape. Teens don’t know what’s in them. About 66% think that vapor only contains flavoring and aren’t aware of nicotine or other potentially harmful ingredients. They can blow up. Although not common, e-cigarette batteries can overheat, catch fire or explode, causing serious injury. The minimum age to purchase e-cigarettes was set at 18. The FDA is enacting regulations to ban the sale of fruity or sweet-flavored e-cigarettes at most retail locations, such as convenience stores where underage users may get them. In Maryland, there is no statewide ban on indoor vaping — except on MARC commuter rail system train – but Baltimore City and Howard, Montgomery and Prince George’s counties have set tougher rules. E-cigarettes may have the potential to help smokers quit, but more young people are using them, facing addiction and potential health issues. The bottom line is, smoking is still risky, whether you use a cigarette or a plastic tube. 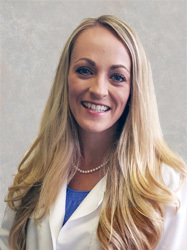 Abby Griffin, Certified Registered Nurse Practitioner, sees patients at MPCP’s Pasadena office. She is board certified by the American Association of Nurse Practitioners. Try to get regular, moderate exercise on a daily basis – or at least 5 times a week. Even a 20-minute daily walk can improve your fitness and may help your immune system fight infection.